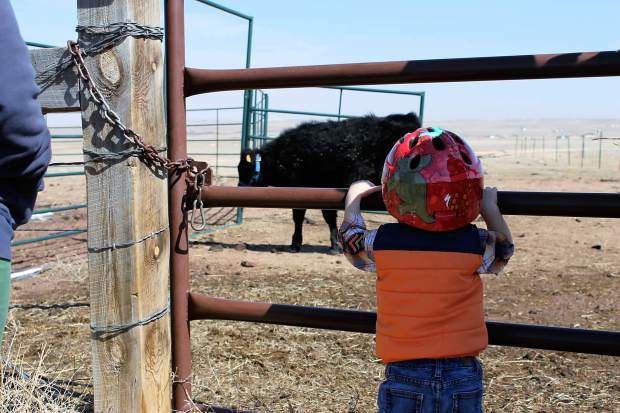 Cord Moore, age 2, is fascinated by the steer Big Mac. This was Cord's first visit to his grandparents' Hold Your Horses Ranch after his family moved back to Colorado from Georgia in 2014. The ranch’s website should be up in spring 2015. Anyone seeking more information about Hold Your Horses Ranch grass-fed beef, free-range eggs, horse training or riding lessons can call Kathy at (970)682-8909. Greener grass on the other side of that proverbial fence changed a career military man into a rancher. George Hilgendorf, now age 60, began his working life as a dentist. Patriotism and an offer of good benefits led him into the Navy in 1979, where he remained for three years. Then Naval Lieutenant Hilgendorf became a reservist while maintaining a dental practice in Fort Collins, Colo., for the next nine years. In 1989, Hilgendorf and wife Kathy were married. Hilgendorf, whose rank had advanced to Commander, was called into active duty in 1991 during Operation Desert Storm. From Fort Dix in New Jersey, he spent 3 ½ months in the Persian Gulf where he ran a dental clinic in Bahrain. Although never in combat, he was nearby when several incoming missiles were shot down. He also made several trips to Saudi Arabia while stationed in the Gulf. Hilgendorf said everyone on base carried a gas mask everywhere they went. Luckily, he never needed to use his. His return to Colorado proved to be nearly as tenuous as life in a war zone. The property where Hilgendorf’s dental practice was located was abruptly sold, forcing an extremely brief move to another area of town. In 1992, Hilgendorf went into extended active duty as a reservist and moved his family to Jacksonville, Flo. A lengthy Naval career ended in 1996 when an Air Force recruiter convinced him to pursue dentistry in that branch of service. Hilgendorf resigned his Navy commission after Congress ratified his Air Force one. He immediately reported to base in Birmingham, Ala., for training. From there, he served stateside and in Germany for three years, Korea for one and Japan for two. All the while. he and Kathy agreed that someday they’d like to firmly plant roots in a farm/ranch setting. Their vague dream began to materialize in 2011. The Hilgendorfs returned from Japan to Fort Collins to be with his critically ill mother, who died soon thereafter. That sad event did, however, precipitate an optimistic plan to find a rural property. In November 2012, they purchased the perfect place, 40 acres in northwest Wellington. The move wasn’t exactly a “Green Acres” shock to the system. Kathy had grown up around ranches. George’s sister Debra had long-owned horses. The siblings had ridden together as children, including on vacations from age one until into their teens on their parents’ 10 acres near Rocky Mountain National Park, just below Long’s Peak. Hilgendorf recalled that nearby Columbine JJK Ranch used to allow the children to take out horses on their own for an entire day, which would now be an unheard of, and potentially litigious, courtesy. Buying the Wellington acreage, christened Hold Your Horses Ranch, proves there’s truth in that “grass is always greener” adage. Folks who’ve spent a working lifetime toiling in one place often retire to a leisurely resort or hit the open road in some sort of self-contained conveyance. Luxurious motor homes or seaside condos are often favored over hip-hugging snowdrifts, bloated livestock or crop-ravaging pests. Hopping the greener grass fence onto the other side, the world-traveling Hilgendorfs instead sought a place to settle down growing chemical-free food products and supporting themselves and neighbors through such concepts as barter. Kathy had rescued an abused horse, a gelding wearing an ingrown halter cutting into his face and sporting numerous welts. She’d initially boarded him out after the 2011 move to Fort Collins, then moved him to the Wellington property. As surely as he healed, an idea more fully evolved to build an actual working ranch. The Hilgendorfs first bought two calves, then a flock of chickens. In spring 2014, three miniature horse yearlings trotted onto the scene, followed closely in June by two three-year-old, full-sized mares. Seasonal turkeys stay just long enough to be readied for Thanksgiving tables. More calves will, using Hilgendorf’s naval lingo, come aboard in 2015. Four of them will spend the summer on a family friend’s 350-acre pasture near Yampa. A three-year-old will be butchered this year. Kathy Hilgendorf said they plan to increase the herd gradually, not wanting to get in over their heads. They intend to keep overhead low so they can offer grass-fed, organic beef at an affordable price. Other facets of the ranch include horse training and free-range chicken eggs. Kathy is working towards Clinton Anderson certification. Having ridden since age five, she prefers starting young horses rather than purchasing older ones that might come with issues requiring retraining. She plans to use her two mares as lesson horses and will also work with clients on their horses. As in 2014, the Hilgendorfs will sell free-range eggs and organically grown produce at farmers markets again this year. They’re also hoping to purchase more land for hay production and pasture in northern Colorado..
On active duty until retirement in August 2016, George won’t then as much abandon ship as he will trade his Air Force uniform for Carhartts. And, as he sets down one drill, he’ll probably pick up another that bores into fence posts rather than teeth.